Amazon * Kindle * Barnes * Nook * Indie Bound * Harlequin * Indigo * BAM * Audible * kobo * Walmart * Target * Indigo * BAM * Book Depository w/worldwide shipping * Books on Board * iBooks * iTunes New York Times bestselling author Gena Showalter presents a classic Lords of the Underworld tale about a warrior trapped by darkness and the woman determined to save him Having endured weeks of torture in the bowels of hell, Kane wants nothing to do with his beautiful rescuer, Josephina Aisling. 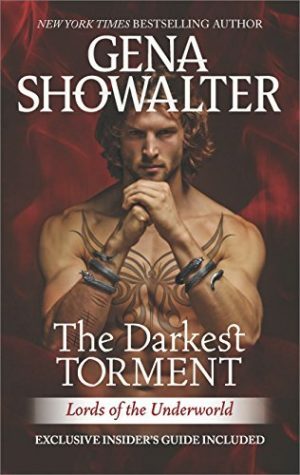 The half-Fae female threatens to awaken the demon of Disaster inside him—a beast he’s determined to kill, no matter the price. Josephina is hunted by a brutal enemy—her royal family—and Kane is her only source of protection. He’s also the only male to ever set her aflame, and even he succumbs to the heat. But as they navigate the treacherous world of the Fae, they are forced to make a choice: live apart…or die together.